I've unpacked the bags. including the treasures from my little shopping spree at Bolt Fabrics in Portland. I've woven in the ends on the finished aircraft-craft (I took a crochet hook on board, rather than the potentially confiscatible deadly-sharp-instrument knitting needles). This is a Boteh Scarf - an old favourite - made in Bamboozle (bamboo/wool blend) yarn. Since my body clock never fully adjusted to American time, I haven't had much of a problem with jet-lag on my return, but I must say that I'm not yet running on full power (definitely feeling more Reliant Robin than Porsche this week). There have been early nights (like... 9pm!!) 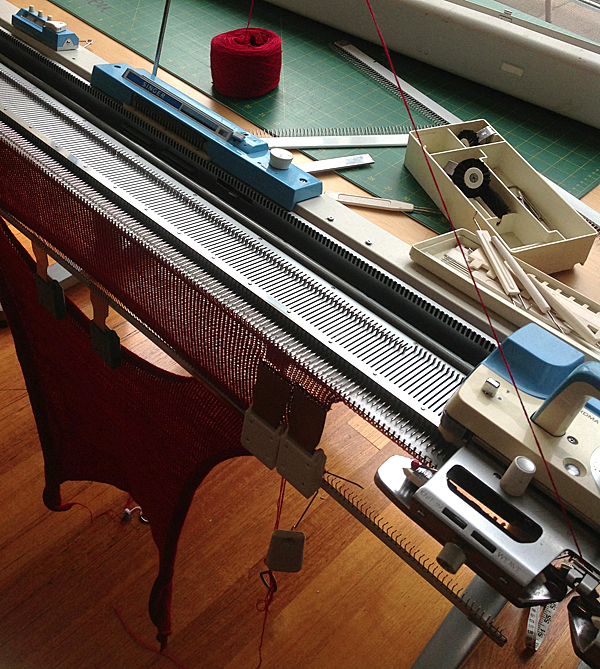 and there has been machine knitting. A fabric shaving accident (removing pilling) on my favourite red jumper (sweater) means that I'm in the market for a new red jumper. (I have since felted the original, to be recycled into something fabulous at a later date). Unlike the smallest of the YOU SEW GIRL crew, who sat down at the sewing machine the very minute we walked in after 30-zillion hours of airports and air-travel, I haven't sewn anything new since we returned from America. I've been following up emails, writing proposals for future work and thinking about classes and workshops. The editing process has also begun on the new book. Life and work go on. 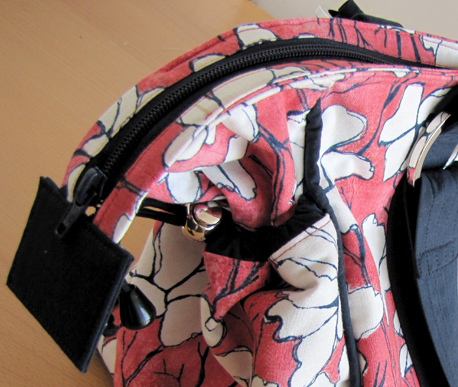 I've also decided to add a couple of new zipper methods to the repertoire in the Zippers For Bags workshop. Even if you've done the workshop before, you can do it again, with a few more techniques to choose from (and I have a few more notes to write for classroom handouts). 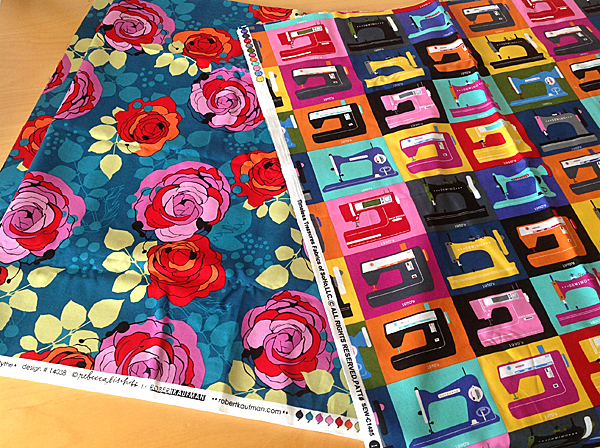 We're revamping a few old designs as pdf patterns and cooking up a few new ideas to add to the You Sew Girl range. 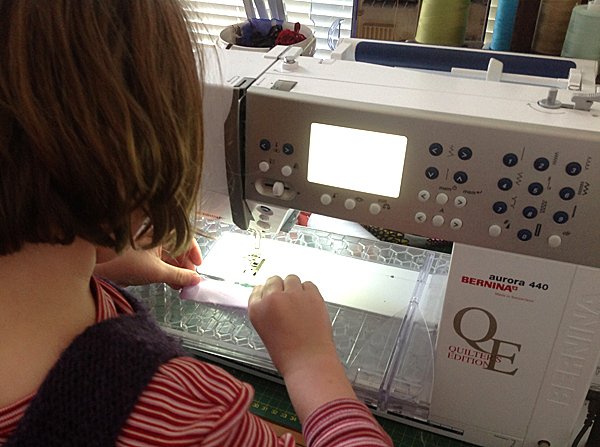 I'm a bit excited that there are now US-based stockists of YOU SEW GIRL patterns. Over the next week, we'll be updating links and letting you know where you can find them. Watch this space! even your 'too busy and tired to sew' is exhausting! 9pm. tell me you didn't get up at 5am and start all over again. I've got to go sew some thermolam to a bit of oilcloth.... which is why I'm here instead. Do you have stockists in Perth? Still finding my way around and haven't come across a fabric shop yet. Fab scarf, and love that sewing machine fabric! Hope you can work out your jumper problems pronto! Welcome back. Sweet scarf. Great thing to do on a plane.